The issues surrounding part-time work are numerous and the digital era that we now live in presents the ideal environment to address these issues and move the world of work forward. The Guardian recently reported that “3 in 4 Britons suffer from stress” and that women are the most affected. In an unsurprising correlation, women (trained and qualified ones) are often the ones working in part-time roles, finding themselves with little alternative after starting a family. For starters, calling it “part-time” work has come to mean that the full or entire job is not being done, bad for those in part-time roles who are often expected to do more than their time allows. For managers, it’s worth being mindful of this as it causes unnecessary stress to an employee, which in turn causes decreased productivity. 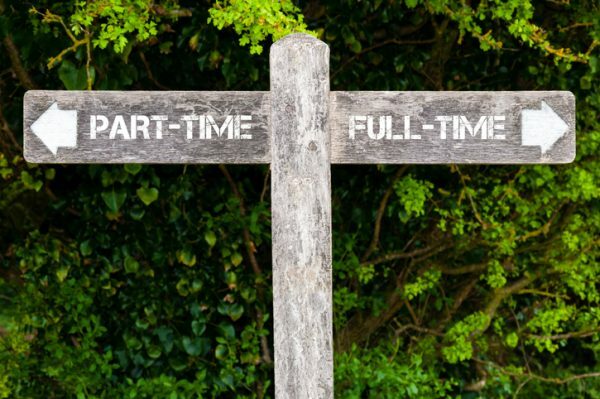 Aside from being less than ideal for both employee and employer, it gives part-time work a bad name. Instead we could refer to it as flexible or agile working, which paints a more collaborative picture which can help the employee in question feel as though they are being properly valued. (And feeling valued leads to higher levels of engagement and motivation). Juliet Turnball (founder of 2to3days.com a website that matches flexible work to mothers) says: “Everyone knows that the returning woman is doing a five-day job in four days – for 20% less money.” She believes that with the digital revolution in full swing, valuing presenteeism is archaic. People can easily work from anywhere using smart phones and laptops. And it is this flexible working attitude that can help combat the stigma of being a part-timer. As part-time or flexible work becomes more widespread, rather than shoehorning a full-time role into part time hours, it’s important that managers and employers design these roles properly. Research published in the journal of Human Relations has indicated that, in many cases this isn’t the case. A Timewise study proves there is a huge unfulfilled demand for flexible work, so forward-thinking employers would be wise to take advantage of this. Designing and offering more flexible roles will widen the pool of excellent potential recruits, and just because someone is not sitting at a desk from 9-5 it doesn’t mean they can’t substantially add to the business. * 63% of full-time employees already work flexibly in some way. * 87% of all full-time employees either work flexibly already, or say they want to. * The preference for flexible working is strong for both sexes: 84% of male full-time employees either work flexibly already, or say they want to. For women this rises to 91%. * Younger workers want flexible work the most: 92% either work flexibly or say they want to. * Amongst the different types of flexible working patterns, 1 in 4 (25%) of all full-time employees would specifically prefer to work part-time for part-time wages. * 93% of non-workers who want a job would prefer to work either part-time, or flexibly in a full-time role. * And among self-employed people, 89% work flexibly. * People are most likely to say their reason for wanting to work flexibly is work/life balance, or it being generally useful or convenient. Other key reasons include commuting issues, leisure or study interests, and caring responsibilities. Having surveyed over 8,000 small to medium businesses across three continents, Timewise found the overwhelming message was that of enhanced performance attributed to flexible work patterns! This goes against everything that the traditional working model stands for and presents a no-brainer for hiring managers who want to get the best people involved. 61% of respondents globally said their company’s profits increased. 83% reported an improvement in productivity. 58% believed that flexible working policies had a positive impact on their organisation’s reputation. Businesses are increasingly taking note of the possibilities flexible work can offer them and with technology such as HR software making flexible and remote working easily achievable, expecting fewer hours (receiving better results) and getting comfortable with remote workers is proving to be the path to a brighter future.